observable by a number of techniques. Larger flares can emit as much as a thousandth the energy of the sun during the duration of that flare. Subatomic particles are shot out at various speeds as well. These releases take different times to traverse the space between Earth and Sun but eventually impact the Earth’s atmosphere causing changes in propagation of radio waves and the beautiful aurorae seen at temperate and polar latitudes. Typically, flares last a few minutes to as much as four hours though most are from ten to twenty minutes in duration. More energetic flares tend to be of longer duration, especially when observed in shorter wavelengths. In visible spectrum observations done by amateurs the relationship is not quite as good. Flares are best seen in monochromatic light such as H-alpha or the H and K lines of calcium where only light of one absorption line is allowed to enter the telescope. Since flares are in emission in these lines, whereas the rest of the disk of the Sun is generally in absorption, they appear quite bright against the disk. In some cases flares can be so energetic that they will even be seen in the light of the continuum of the spectrum (between the dark absorption lines) as viewed in the amateur’s telescope. These White Light Flares or WLFs were once thought to be relatively rare. Not all sunspot groups produce flares. In 1938, M. Waldmeier devised the Zurich Sunspot Classification of these groups. 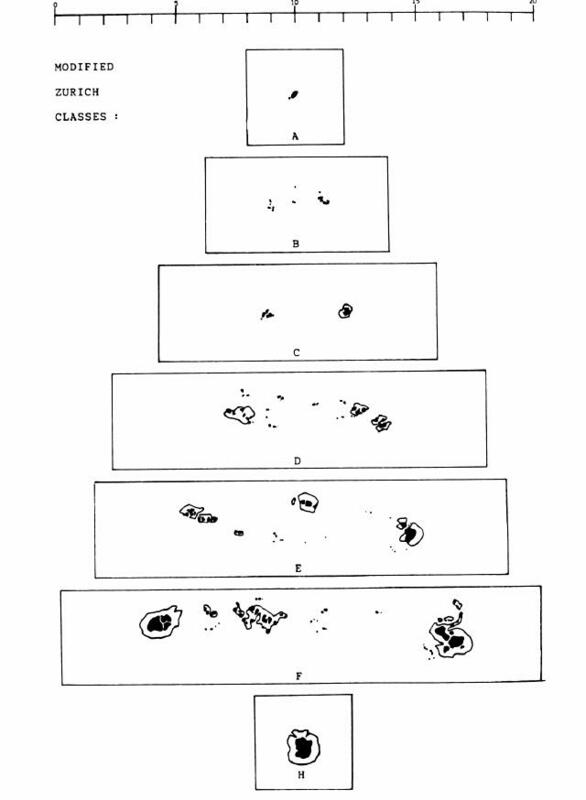 It consists of nine steps or classes (A through J, omitting I) that delineate characteristic evolutionary stages of sunspot groups, though not all groups go through all classes. Most groups go only part way through the sequence and then either rapidly go backwards through the classes or decay to the final class. In general, the greater the area of a group the more asymmetrical will be its growth curve. So a large group will rise rapidly from class A to E and decay more slowly as it goes from E to J. Groups of classes D, E, and F are the big flare producers. But not all such groups produce big flares. This was a problem for flare forecasters on whose work various broadcast and space industries depended. Even with the most active class, F, a forecaster had a marginal chance of predicting flare probability in any given 24 hour period. In order for flares to be studied, a reliable system for identifying flare producing sunspot groups was needed. An observer would have to spend much time at the telescope observing every well developed group in hopes of seeing these elusive events. It would have been highly advantageous, on the basis of a few parameters, to weed out many less productive groups. In 1966, Patrick McIntosh of the Space Enviroment Services Center of the National Oceanic and Atmospheric Administration, introduced a sunspot classification system that improved the older Zurich system. The new classifications consist of three letters. First is the Modified Zurich Class. It basically retains the old Zurich Class but G and J were removed as being redundant. A Modified Zurich Class was used rather than a totally new system to be an making it easier for observers that might be reluctant to switch to the new system. The Second letter represents an assessment of the Largest Spot of the group. This is not necessarily the leading spot, but rather the LARGEST. 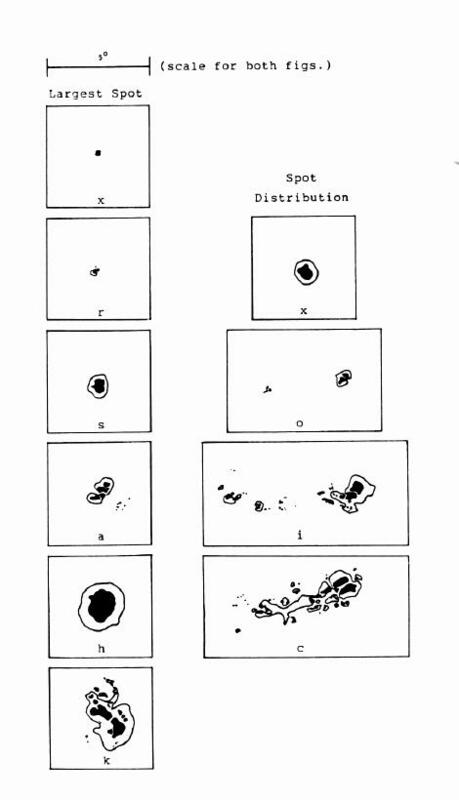 The third letter represents an assessment of the Spot Distribution within the group. It takes only slightly longer than the old system to classify all the groups on the sun for a given day using the McIntosh System, but the information returned and usefulness of the new system makes it worth the slightly added effort. This is a single spot or compact cluster of spots with the greatest separation between spots being less than 3 heliographic degrees (degrees on the Sun’s surface). With a Class H group the separation is taken to be the distance between the outer border of the main sunspot penumbra and the most distant attendant umbra. This is two or more spots forming and elongated cluster with a length of 3 or more heliographic degrees. If there is a large principal spot then the cluster should be greater than 5 degrees in extent. A – A unipolar group with no penumbra. This can be either the early or final stage in the evolution of the group. B – A bipolar group with no penumbrae on any spots. C – A bipolar group with penumbra on one end of the group, usually surrounding the largest leader umbra. D – A bipolar group with penumbrae on spots at both ends of the group and a length of less than 10 degrees. E – A bipolar group with penumbrae on spots at both ends of the group with a length of 10-15 degrees. F – A bipolar group with penumbrae on spots at both ends of the group and a length greater than 15 degrees. r – Rudimentary penumbra that usually only partially surrounds the largest spot. Such a penumbra will likely be granular rather than filamentary, making it appear brighter than a mature penumbra. The width of the penumbra will only be a couple to a few granules (of the photospheric granulation) and may be either forming or dissolving. s – Small, symmetric spot (similar to Zurich Class J) and the spot will have a mature, dark, filamentary penumbra of circular or elliptical shape with a clan sharp border. If there are several umbrae in the penumbra they will form a tight cluster mimicking the symmetry of the penumbra with a north-south diameter of 2.5 degrees or less. a – Small, asymmetric spot with irregular surrounding penumbra and the umbrae within separated. North-south diameter of 2.5 degrees or less. h – A large symmetric spot. Like type “s” but the north-south diameter is greater than 2.5 degrees. k – A large asymmetric spot. Like type “a” but the north-south diameter is greater than 2.5 degrees. x – Unipolar group of Modified Zurich Classes A or H (i.e. a solitary spot). o – Open distribution with a leader and follower spot and few or none between. Any spots between should be very small umbral spots. i – Intermediate distribution where numerous umbral spots lie between the leader and follower spots. c – Compact distribution where the area between the leader and follower spots contains many spots with at least one having penumbra. In extreme cases the whole group may be enveloped into one complex penumbra. This system has proven a more accurate predictor of flares in the thirty years of its use. Indeed, it has helped solar astronomers understand better the relationship between flares and sunspots. Sunspot groups that produce flares are relatively rare. Because of this it has taken several solar cycles of observations to demonstrate the effectiveness of the new system. Using the old Zurich system it was found that groups of class F were most likely to produce flares. But only a 40% flare probability in a 24 hour period could be predicted using this parameter alone. With the McIntosh System, using Modified Zurich Class F, the probability improved to 60%. Using just the Largest Spot class of “k” the probability in 24 hours was 40-50%. If just Spot Distribution category “c” were used, flare probability went up to about 70%. But, when all three dimensions of this system were used, classes Fsi, Fki and Fkc, showed a probability of up to 100% for production of M flares in a 24 hour period and the McIntosh Class of Fkc had a further probability of up to 50% in X flares (x-ray) production! This surpasses any former method of flare prediction used, including sunspot area. s – subflare of less than 2 degrees area. 1 – “Importance 1″ flares, greater than 2 degrees but less than 5.1 degrees in area. 2 – “Importance 2″ flares, greater than 5.1 degrees but less than 12.4 degrees area. 3 – “Importance 3″ flares, greater than 12.4 degrees but less than 24.7 degrees in area. 4 – “Importance 4″ flares, greater than 24.7 degrees in area. This means that a 2B flare is one that was bright and between 5.1 and 12.4 square heliographic degrees area. An SF would be a faint subflare, the most common type. For other parts of the electromagnetic spectrum, like x-ray, there are other classification systems. But since amateur solar astronomers and most particularly the White Light Flare Patrol, or WoLF Patrol, will be observing in the visible spectrum these will not be discussed here. forewarned of the optical flare. classes in order of productivity. In the latter class, flares usually occur just beyond the outer penumbral boundary. Patrick McIntosh once advised me to also watch groups that suddenly arrange their spots in a line. He call this a “linear accelerator” and a good bet as a site for flares. -and rapidly moving spots in a group. is 1 second of arc only about 1% of the time at a good site. So reducing the aperture of your telescope, especially those big light buckets, to 4-6 inches will result in little or no loss of resolution and will yield an improvement in image steadiness (and contrast by producing and unobstructed aperture. This will more than make up for any perceived losses. You can increase your chance of seeing WLFs by increasing the contrast between the flare and bright photosphere. This can be done through wideband filtration, unlike the narrow band filtration of only a fraction of an Angstrom (Ang.) used in H- alpha observations. A good region to filter around is at 4300 Ang. or 430 nm called the G-Band. There are a number of absorption lines clustered here that go into emission in flares. When these normally dark lines become bright the difference in brightness is greater than if you were looking at a bright region of the spectrum. With a narrow band filter the contrast is much greater. Since broad band filtration will take in a fair portion of continuum it is still considered “white light”. Projection techniques will only detect the very brightest WLFs, explaining the paucity of them in the historical records. We have never received a report of a WLF by anyone using the projection method. The most simple method of observation in searching for WLFs, is to just use a mylar-type filter. The blue image of these filters, normally detested by amateurs, is quite close to our target wavelength. This is also the safest way to look for these flares. These filters are also very good and showing faculae associated with these complex groups, well in towards the center of the disk. Only the highest quality filter should be used. There are some filters on the market and some homemade out of lesser quality materials. These show a good deal of sky brightness just off the limb of the Sun. Such filters will probably scatter enough light to obliterate all but the brightest flares. The author has seen several using the so-called “neutral density” filters but it would have been impossible without the prior experience with more selective filtration. Beyond this one can obtain filters of about 100 Ang. bandpass to use at the eyepiece WITH A MYLAR-TYPE PREFILTER!! It may be necessary to reduce the density of the prefilter but such experimentation should be done with great caution. Do not risk your eyes at any time and NEVER USE EYEPIECE FILTRATION ALONE! A prefilter is a must unless you have a specially designed solar telescope. 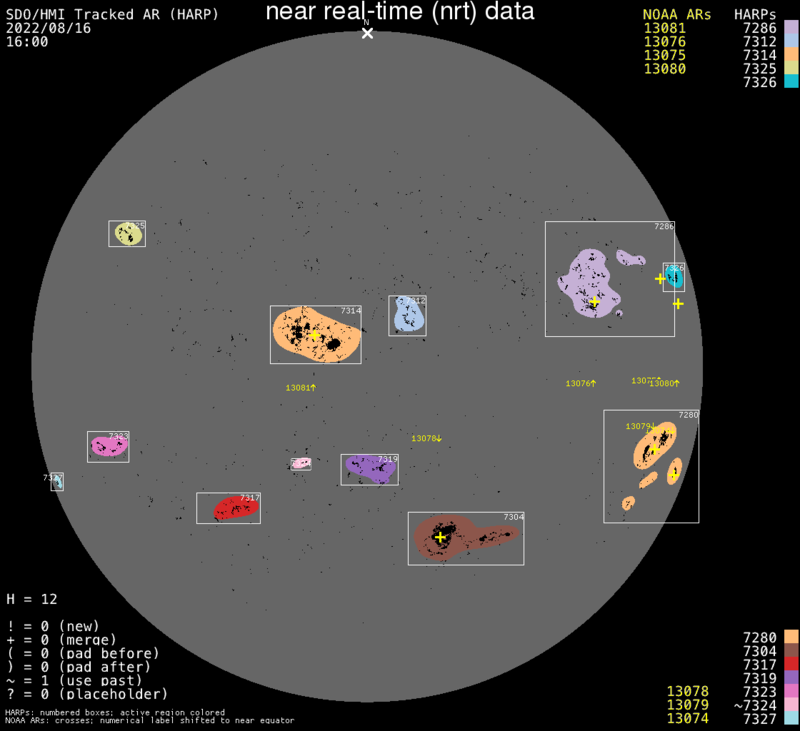 If you are going to do this kind of observing you might do well to build a specialized telescope for the task, but that will not be discussed here. Some experimentation will likely be necessary if you want to go to narrower broadband filters but novices and the unsure are strongly encouraged to just stick with the commercial mylar-type filters. If you don’t know, or aren’t sure, don’t do it! When observing, first make a sketch of the region to be watched on the A.L.P.O. Solar Section WoLF Patrol standardized observing form. (See instructions and form.) Let the spot group fill the box. Once this is done observing may begin. Attempt to observe the region at least once every ten to twenty minutes, the average lifetime of a flare. To check less often would risk missing one. Be patient! It may be quite a while before you bag the first one. If you observe the McIntosh E and F groups cited in our priority list, you will be more likely to see one sooner. Do not sit constantly at the telescope. You will not see change. It is too gradual and your eye needs the rest between observations. Note ANY changes on the form. Not all flares behave the same way and not all precursors are well known. Record time to the nearest second, start and stop. Surges have been photographed in white light but have only been viewed at the limb (see Sky & Telescope, Dec., 1961, p.330). Some of the rapid changes reported in penumbrae in history may well have been observations of such surges. The only way to be sure of such observations is to build a larger data base of observations from which patterns may emerge. Professional observations indicate that WLFs begin as a bright point of probably granule size in one of the sites noted earlier. My own observations during cycle 22 in AR 5060 and 5062 (June, 1988) tend to support this. Other points will pop up near the first in only a couple minutes, or the single one may be seen to enlarge rapidly. These early stages are about all that happens in the smaller flares, and in sub-flares the single point, substantially brighter than the photosphere, may be the full extent lasting only a few minutes. The human eye can detect only changes that are in excess of about 10% against such a background so be aware of any brightening. Dr. Don Neidig, of Sacramento Peak Solar Observatory, in New Mexico, once expressed the suspicion that more such faint flares are visible in white light but because of the low contrast, short lifetime and smallness, go unnoticed. In larger flares the points will grow in brightness, merge and become a bright area or, if you are very lucky, a bright ribbon. If you are so lucky, watch for a double ribbon (running on either side of the neutral line of magnetic polarity) or a shaded, penumbral-like area near the flare which could be a surge. you have a couple hours to spare or while puttering about the yard. You just go to the telescope every ten minutes or so and make your observation. The data is of value to solar astronomy and will be reported by the ALPO Solar Section in both the Rotation Report and our regular reports in the Strolling Astronomer, the Journal of the ALPO. At the risk of stating the obvious, the observations will not make themselves. So make your observations and report them in a fashion where they can be useful, with the WoLF Patrol. Thus, you will by pursuing your hobby, see the most energetic events in our solar system and be contributing to science. Remember, only a couple of hours on a Saturday afternoon may repay you with a view of more energy than has been collectively used by humans in our 2.5 million years of existence!